We know what you’ve come to expect. Never willing to compromise, we’ve delivered yet another issue full of the quality content you’ve come to enjoy. All this and more! Just how much more? 84 FULL GLOSS PAGES OF AIRSOFT! Simply click the link below to nab your copy! And remember…players that don’t know, don’t. Players that do, buy The NAM! P.S. – Tired of being the fool on April Fool’s Day? 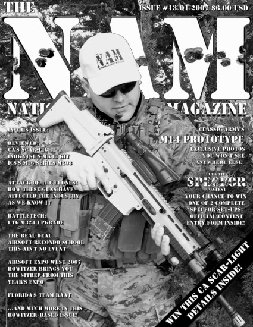 Come and play with us www.nationalairsoftmagazine.com/operationegghunt_07.html .